The consulting firm McKinsey And Company created the McKinsey 7S Framework in the 1980s. Under this framework a successful organisation requires seven ingredients. Each of these ingredients rely on each other i.e. they are interdependent. If changes are made to any one of the elements, the rest of the elements will be affected. All of the seven factors need to be aligned with each other otherwise, the elements will move in different directions and cause conflict. 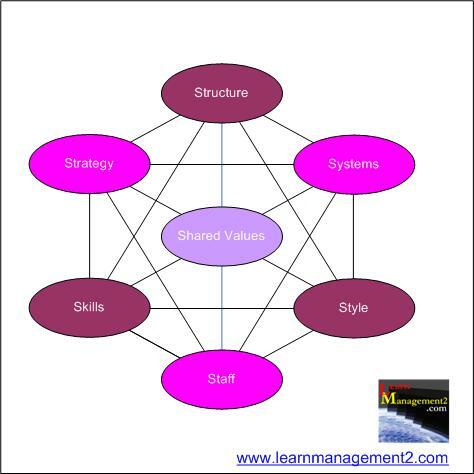 The diagram above shows the seven elements that make up McKinsey 7S Diagram including shared values, strategy, skills and style. How will the firm achieve its aims and shared values? What resources will the firm need in order to achieve these things? An organisation needs to plan its actions and deal with anything hindering its aims. What organisational structure should the organisation adopt? There are a number of different structures from flat to hierarchical structures. Please click here to learn more. The ideal structure will depend on the size of the organisation and its aims. Organisations need systems and procedures to increase efficiency and so that employees know what to do. For example procedures to complete work, hire staff, pay suppliers, and promote products. Effective systems enable organisations to respond quickly to the needs of internal and external customers. They can also be used to implement safeguards which prevent employees, doing something that will harm the organisation. At the centre of a successful organisation, there are shared values and things that are important to the firm. Shared values encompass the organisation's beliefs and shape organisational aims. The mission statement and vision are examples of documents containing shared values. Employees run the organisation, they undertake the actions that need completing. In a successful organisation, each employee's contribution is valuable. Organisation's need to fully evaluate how many employees they need and the type of employees required. This element is about determining what skill set the organisation will require as a whole and from each employee? It's about assessing the capabilities required, for the organisation to secure a competitive advantage. The way the organisation operates, its rules and conditions and the way managers lead and motivate their staff, make up the style of the organisation. The success of an organisation depends on all of the above factors working together, aiming to achieve organisational goals as one unit. This is captured in the diagram below, with shared values in the centre as they are literally "at the heart" of successful organisations. Any organisational change or review should take the elements that make up the McKinsey 7S model into account.